Brickyard Hollow Brewing Co. will donate a portion of their December 19th and 26th Community Night proceeds to the YCAN Fuel Assistance program. Click on the link above for more information about their hours, location, and menu – and consider visiting them on Wednesday 12/19 or 12/6! Thank you for supporting those who need help heating their homes. Get in a Thanksgiving morning workout at Strong Bodies and help YCAN support the Lunch Crunch program (click here for a Forecaster article about the program)! ALL PROCEEDS from this Boot Camp will be donated to YCAN to help support the Lunch Crunch Program. The Yarmouth High School Interact Club is hosting “Kids Night Out” on the first Friday of each month through May – see the above, or this PDF, for further information. The Lunch Crunch program (summer breakfasts and lunches for Yarmouth children who might not otherwise get enough food during the week) will be one of the beneficiaries of funds raised via Kids Night Out. Purchase a $12 Lunch Crunch mug and receive a FREE cup of Maple’s coffee! ALL proceeds from mug sales go to support the LUNCH CRUNCH program. In its fourth year, LUNCH CRUNCH provide activities and two healthy, square meals to our students during the summer. Help us alleviate summertime food insecurity for Yarmouth children. 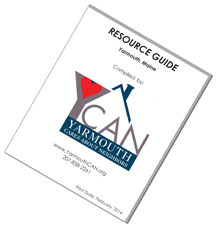 For more information, to donate, or to get involved, please contact Yarmouth Community Services’ staff at (207) 846-2406. Admission is free, but there is a suggested donation of $10 to benefit the Food Pantry. The program will also feature a brief report from the Food Pantry, how they help some of the neediest families in the area put food on their tables. They now serve approximately 90 families (230 individuals) each month. Please mark your calendar for this delightful and unusual concert…it’s a great opportunity to support one of Yarmouth’s most worthy and beneficial organizations.